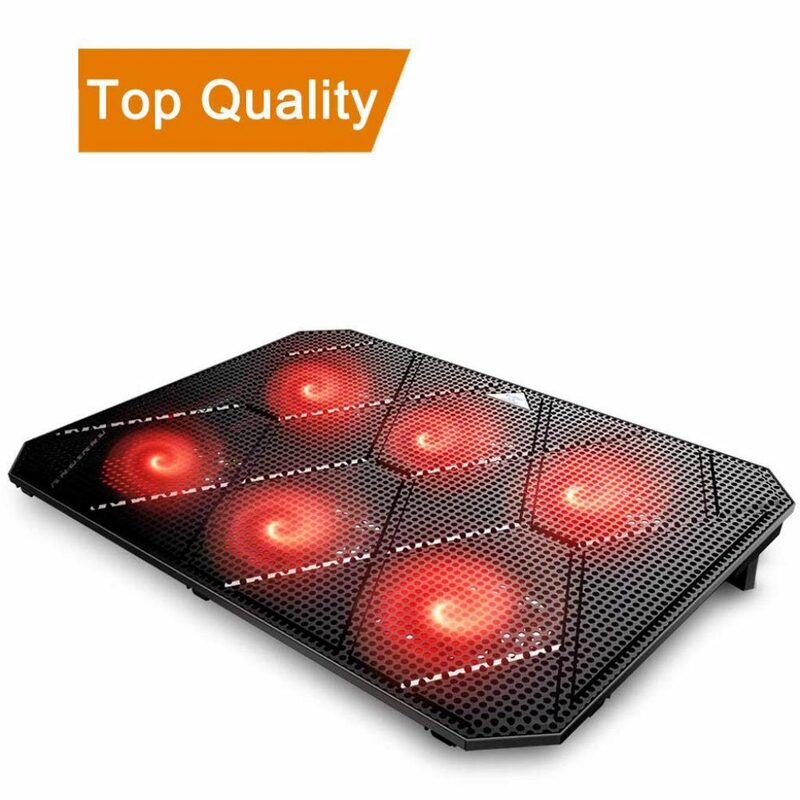 An overheating laptop is a real pain. 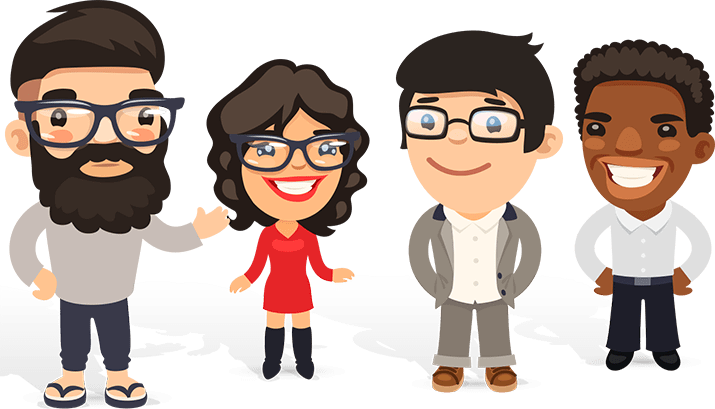 We’ve all been there – slap bang in the middle of the most crucial part of the game, the screen goes black and the whole thing powers down for a rest, while we sit there getting hotter, wondering if we’ll have to do the whole thing again! As well as your stress levels, it’s bad for your laptop too – and we don’t mean when you throw it at the wall in frustration. 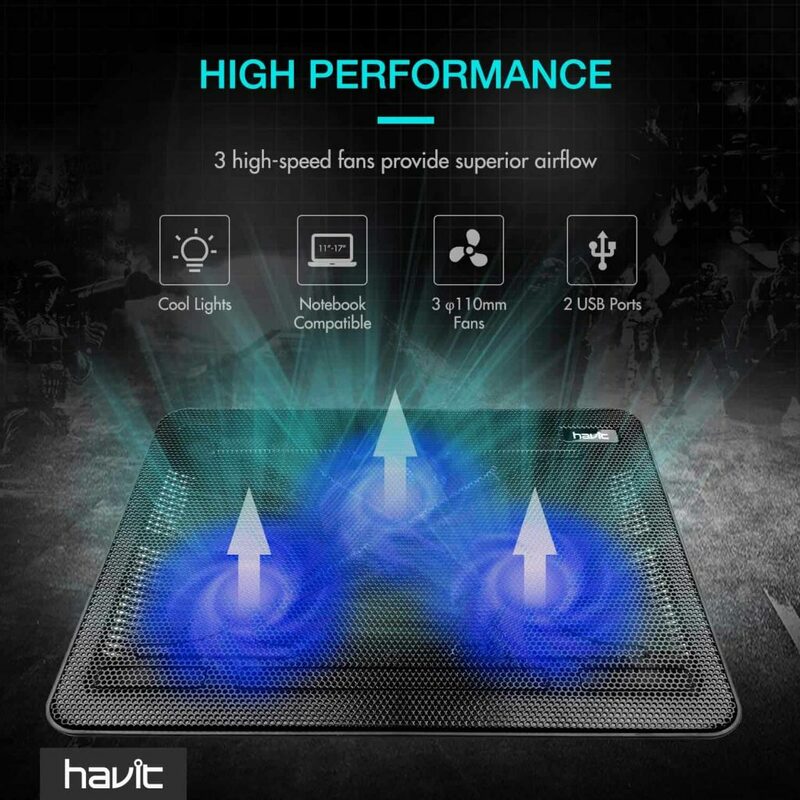 It can lead to reduced performances all round, and actual damage to the hardware. 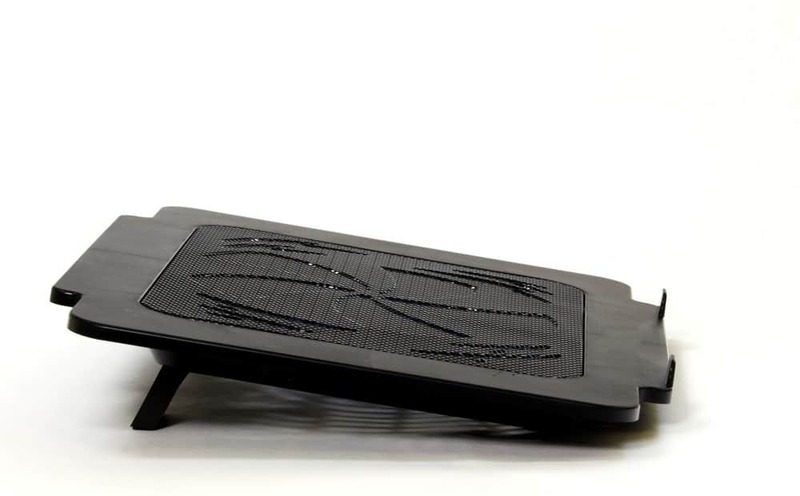 A laptop cooling pad helps your device maintain a normal temperature and performance stability; it’s a simple, affordable solution to frustrating and potentially damaging problem. 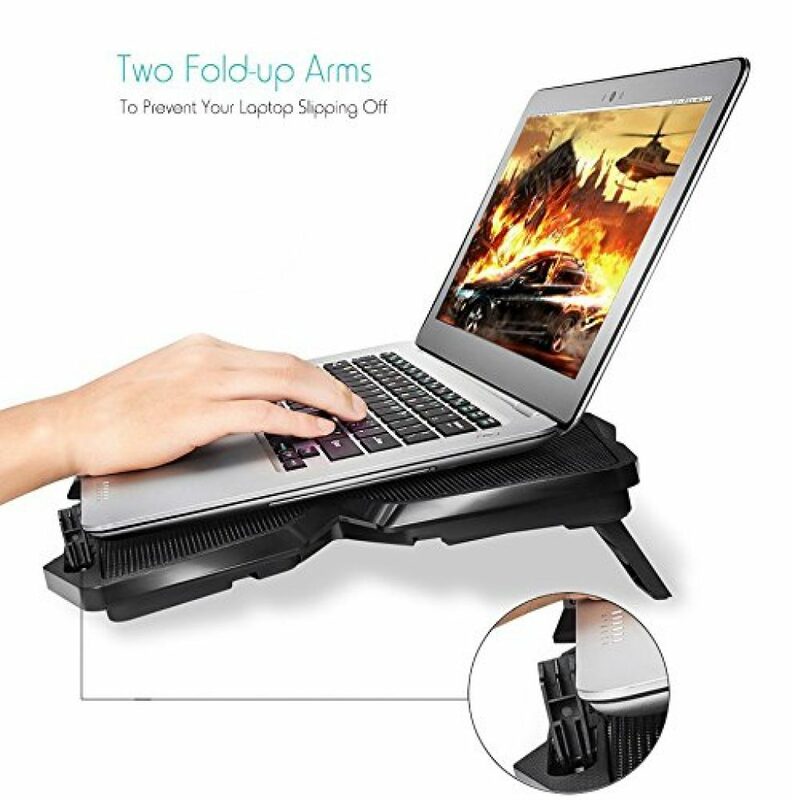 The only catch is that, as with most computer accessories, there are hundreds to choose from, each promising bigger and better things. So, where do you start? 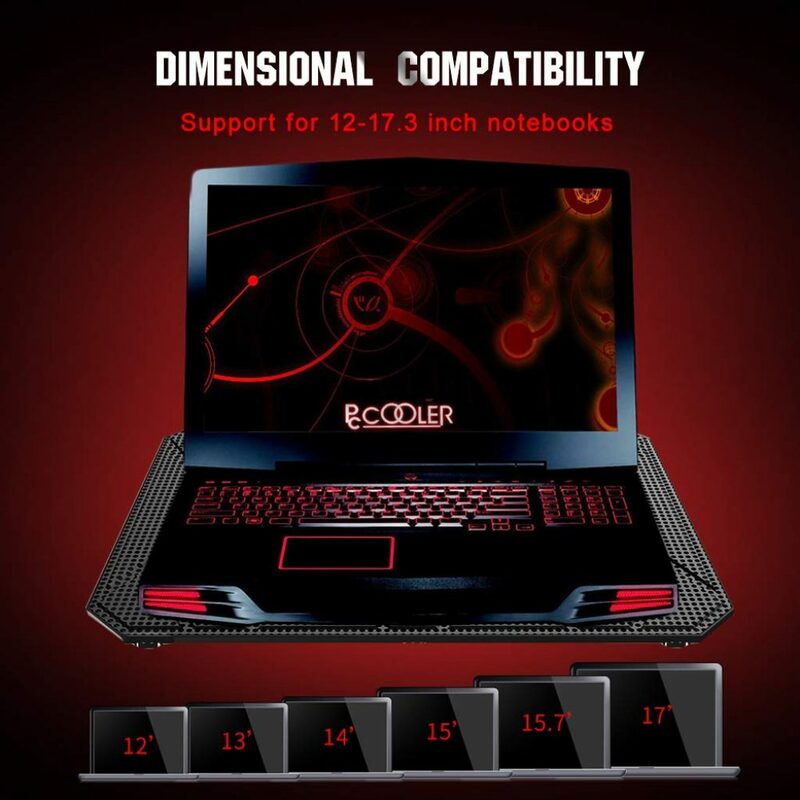 You need to think about the size of your laptop or find a cooling pad that’s been designed to fit your specific model. 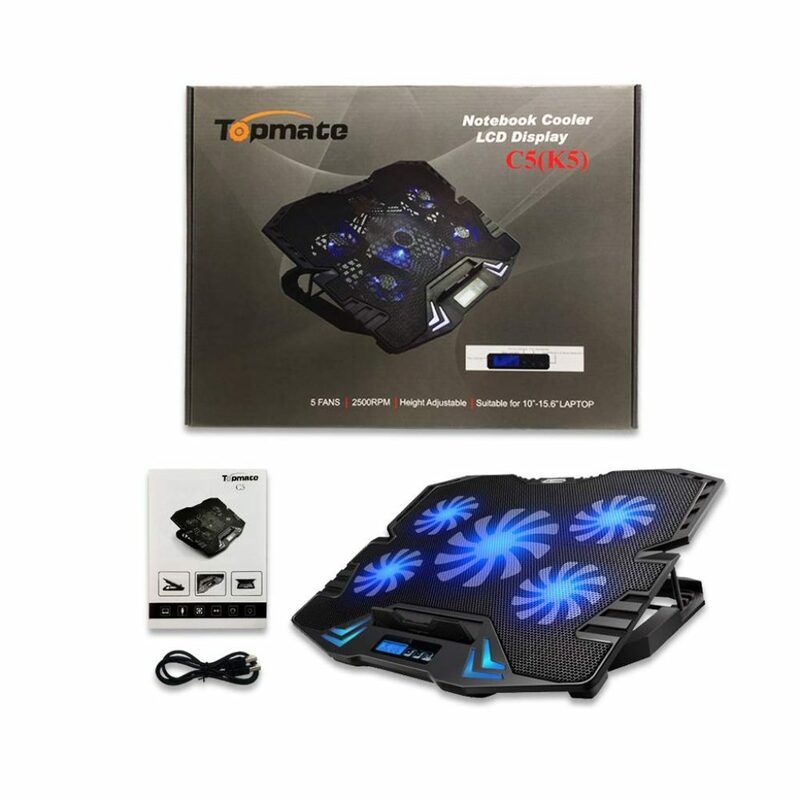 Also if you require it for work, a more professional pad is required than if you’re a gamer – then you can get away with flashing neon lights. 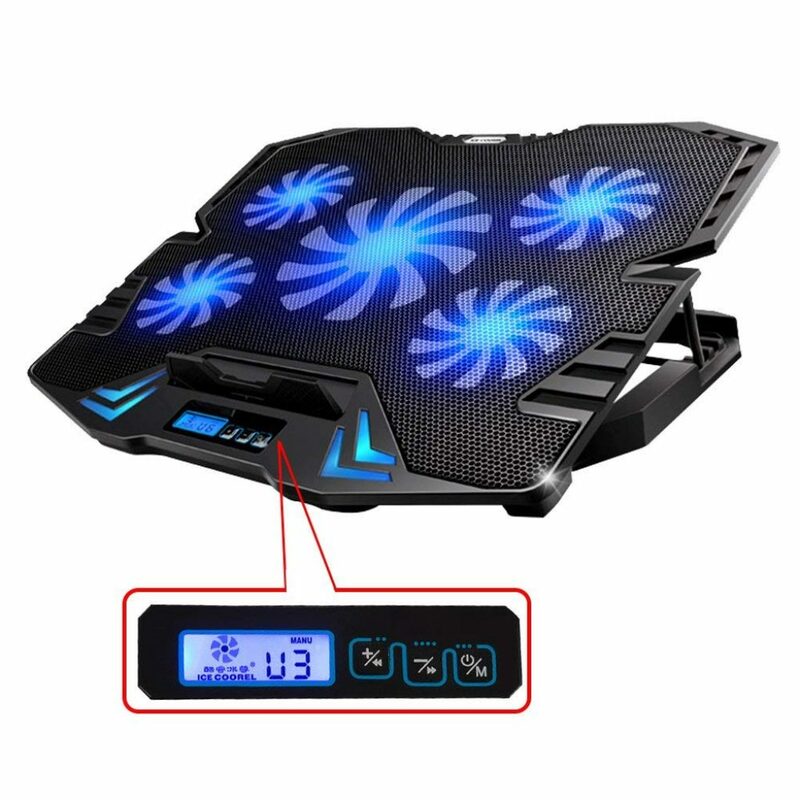 Some cooling pads are designed to be portable, with weight and durability being important factors, whereas others are made to be more static for using in one place. There is a model to suit every purpose. 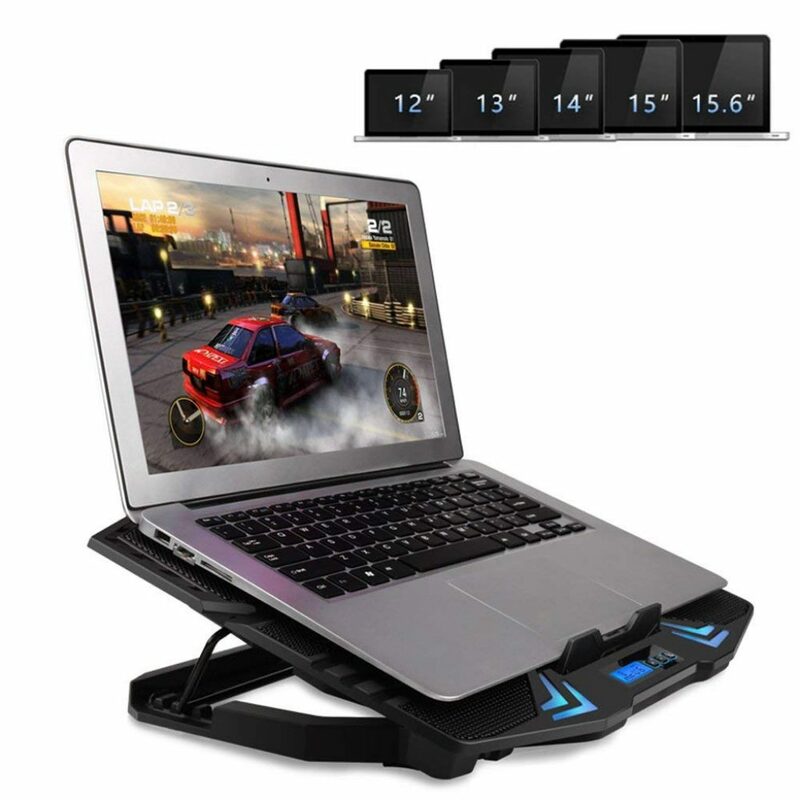 This ultra slim laptop cooler doubles as an adjustable, ergonomic stand and its built-in dual-USB hub allows connection for more USB devices. 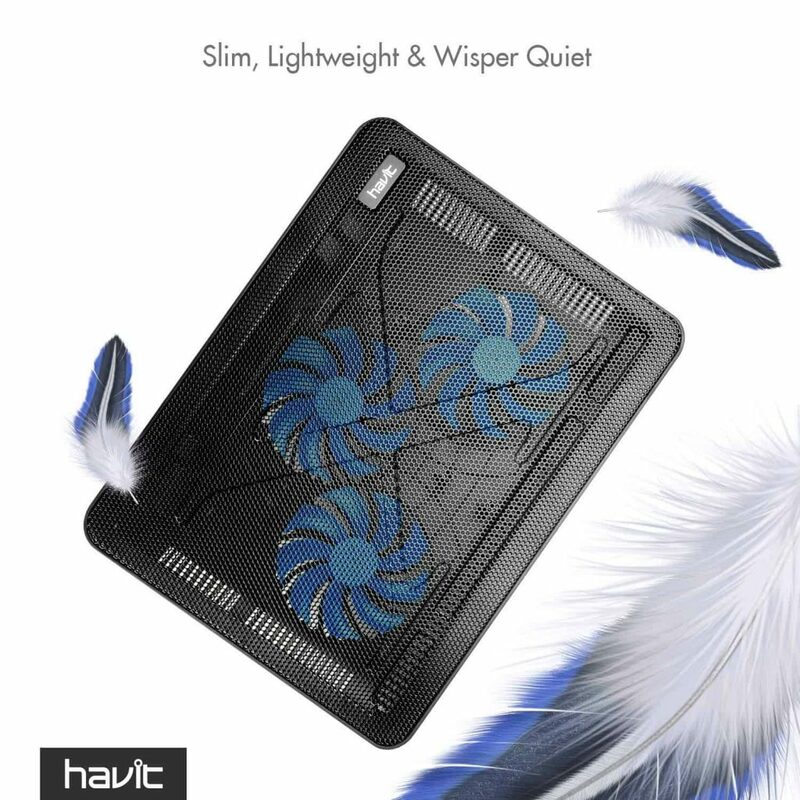 Being portable, Havit have thoughtfully made this wear resistant, lightweight and comfortingly sturdy. 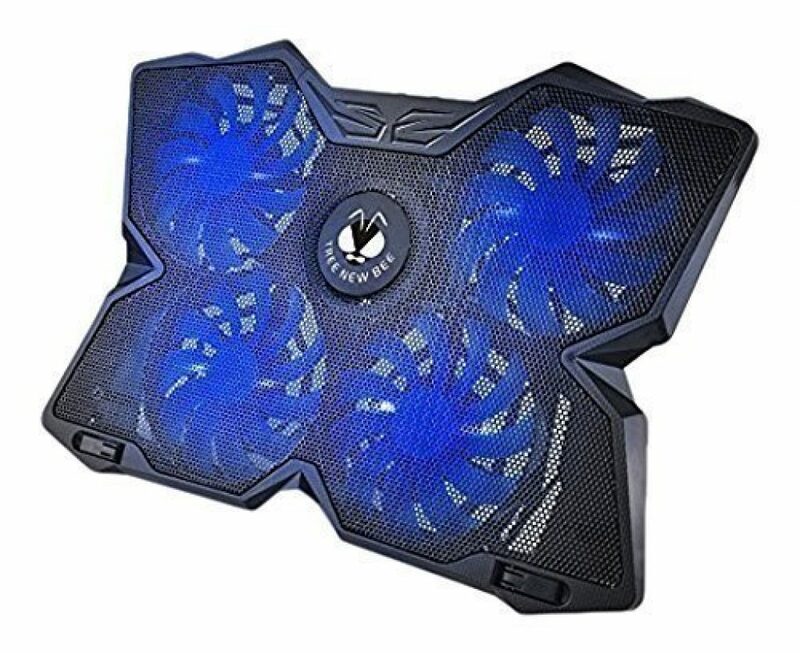 The three fans work near silently to cool down laptops, and they did an excellent job with ours after many hours of solid gaming – it’s for research purposes only, honestly, and the whole thing glows an eerie, sci fi neon blue when whirring. 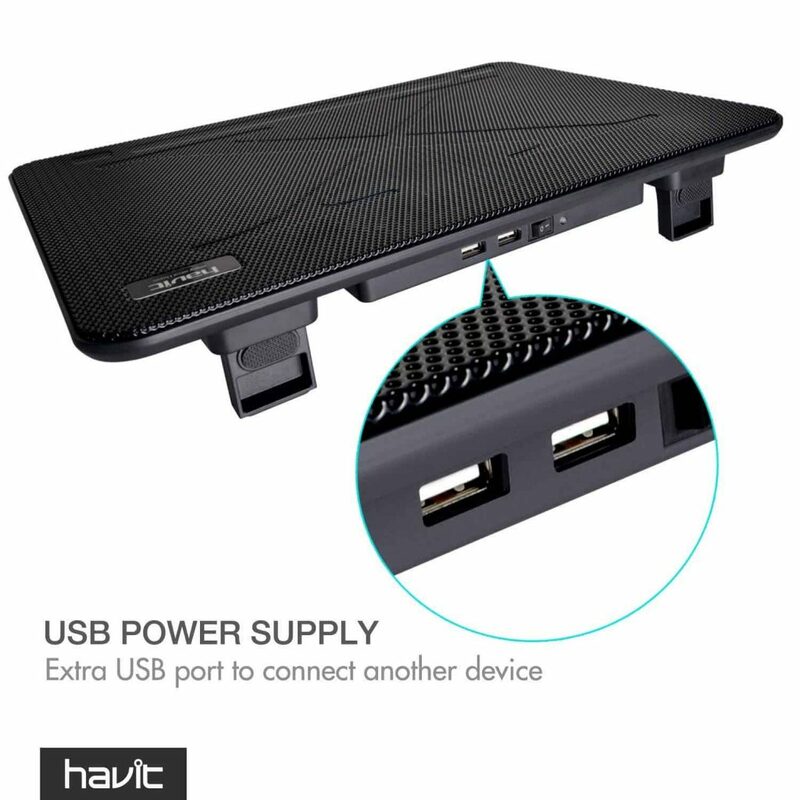 Having a dual USB hub is a great idea for this nice little laptop cooler. Some may find the lights distracting, so an option to switch them off would be useful, but we love them! 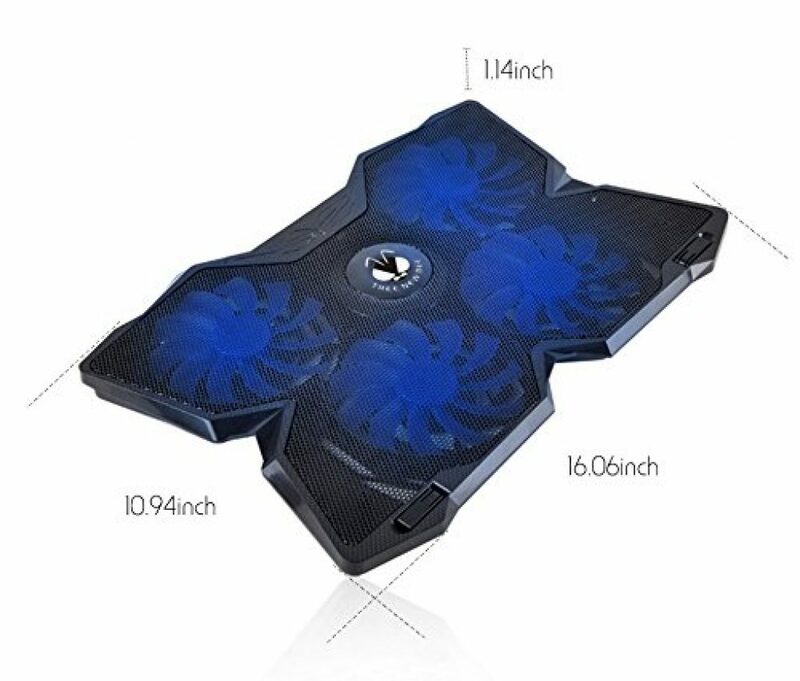 If your laptop suffers from overheating, this does its job efficiently without any fuss, and it glows blue! What more do you want? 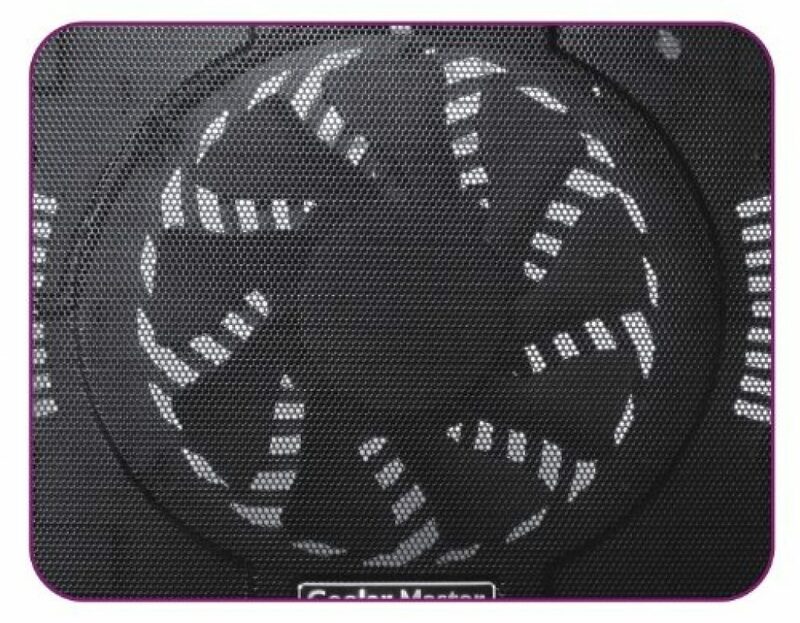 Available in a variety of sizes, this model from PC Cooler has a stainless steel honeycomb mesh design for cooling and dissipating heat. 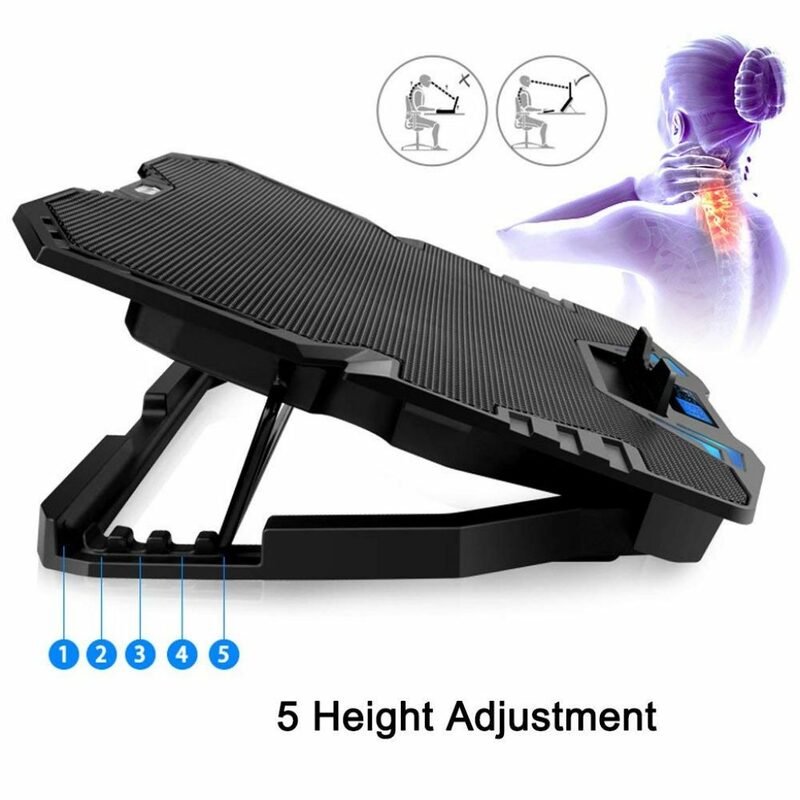 It feels well built, is lightweight and easily portable, and has 30 adjustable angled positions, eliminating any neck strain. 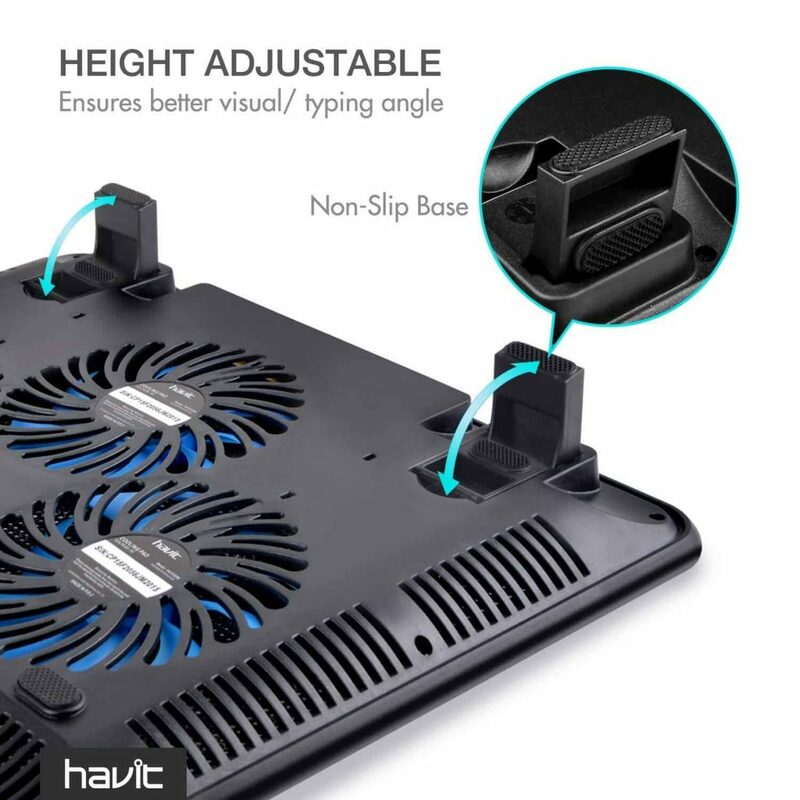 Even after hours spent gaming, our laptop wasn’t hot, and our necks and shoulders didn’t ache thanks to the near infinite number of angled positions this can adjust to. 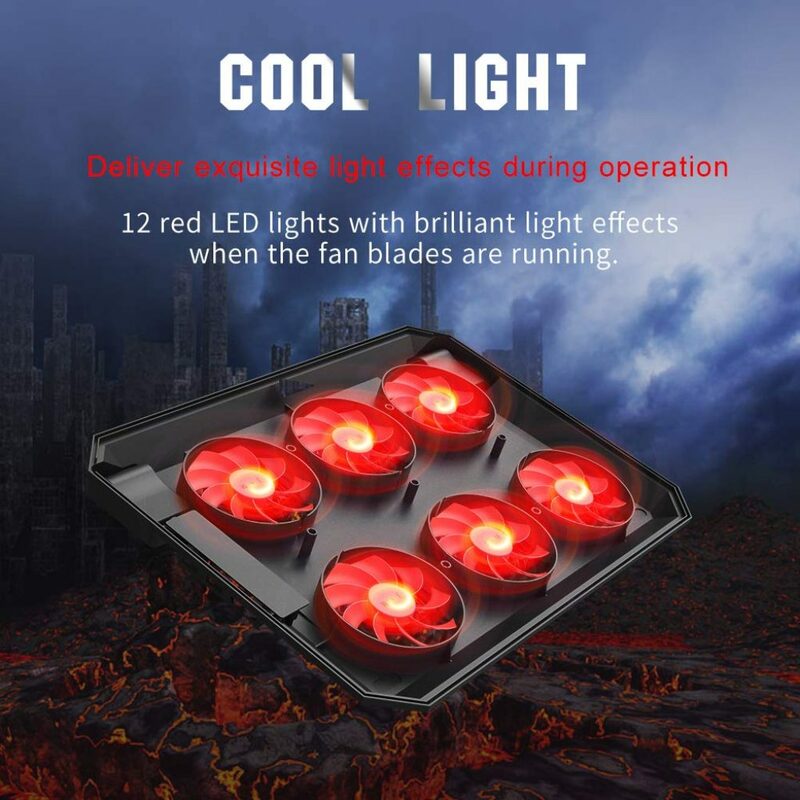 With six fans, multiple settings, and 12 red LED lights, which glow brighter as the fans work harder, this well designed cooler ticks all the boxes, and kept our machines super cool. 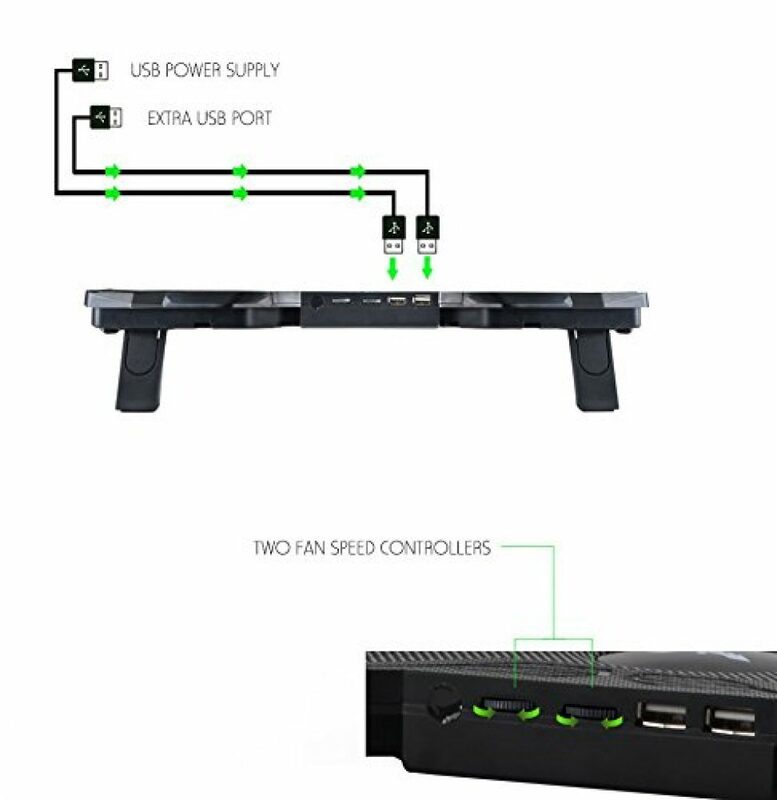 The addition of an extra USB port would be a great idea. 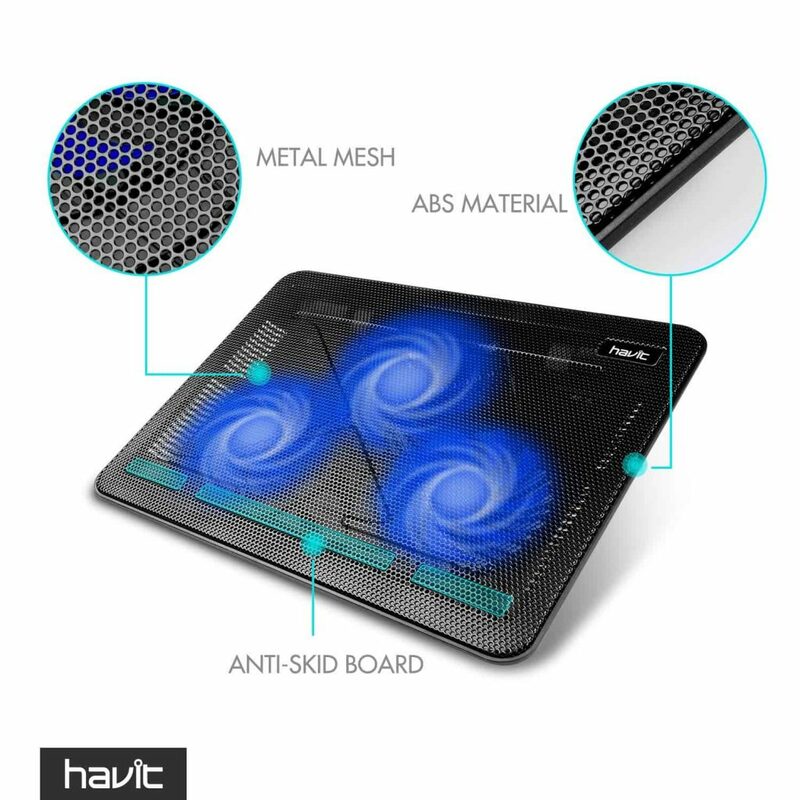 【Honeycomb Mesh Design/Rapid Cooling】PCCOOLER laptop cooling pad with 2.5mm stainless steel honeycomb mesh design to provide excellent airflow, and improve heat dissipation. 【Ultra-narrow bezel design】Beautiful and simple. 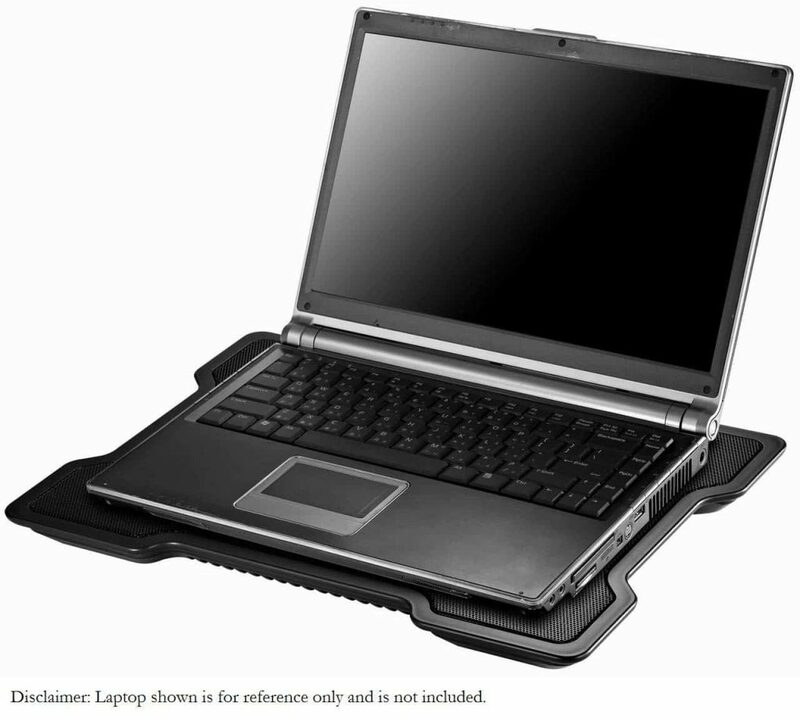 Light weight allowing you to carry easier and protect your laptop. 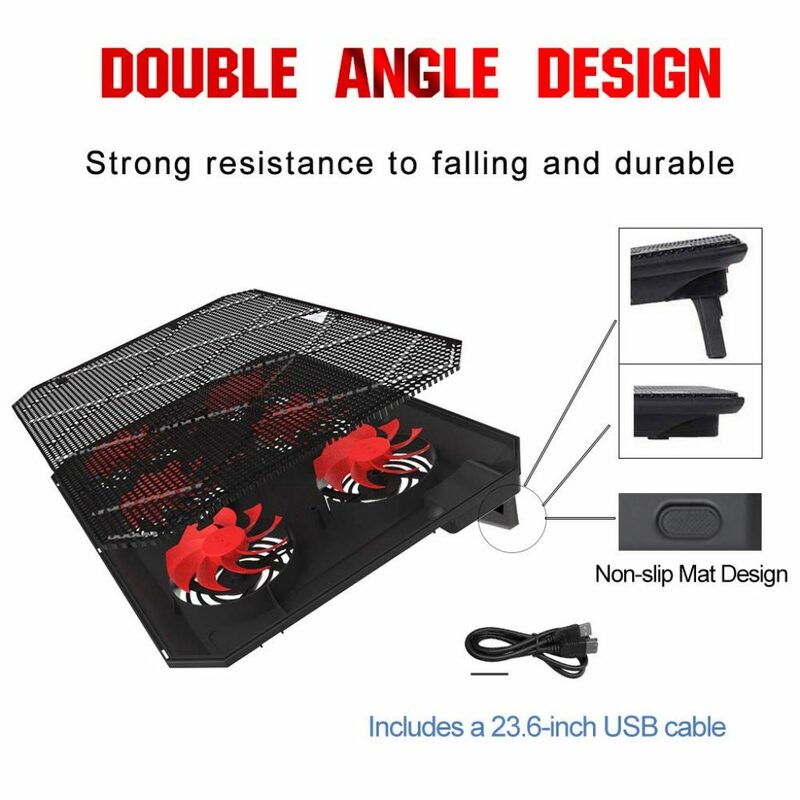 With five fans, including a larger central one, this adjustable angle cooler is a well made, stylish device. 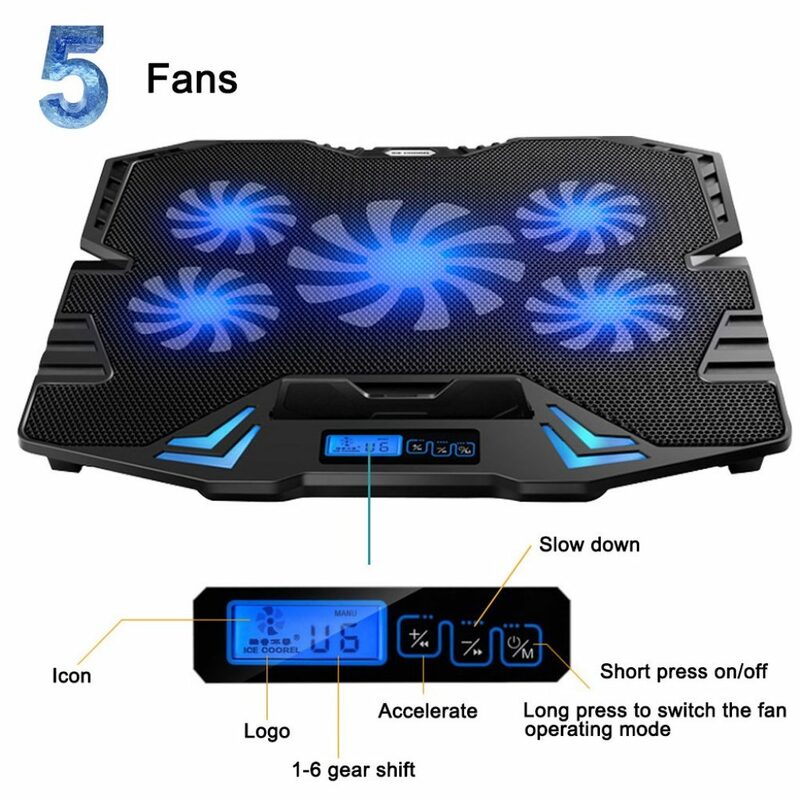 The LED display and controls take care of the six speed settings and the various modes available. 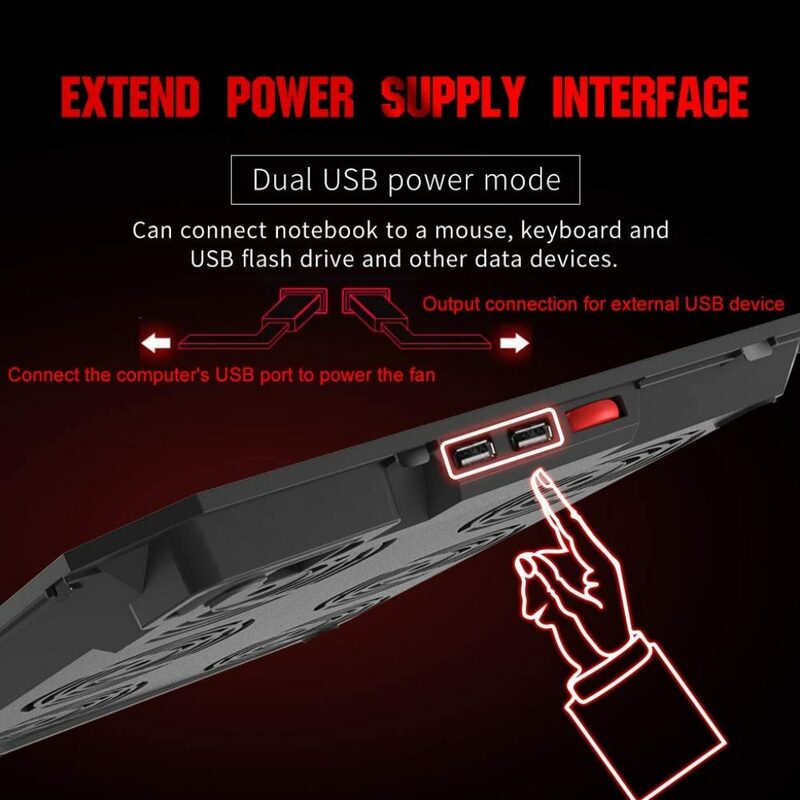 There is a built in dual USB port completing the picture. 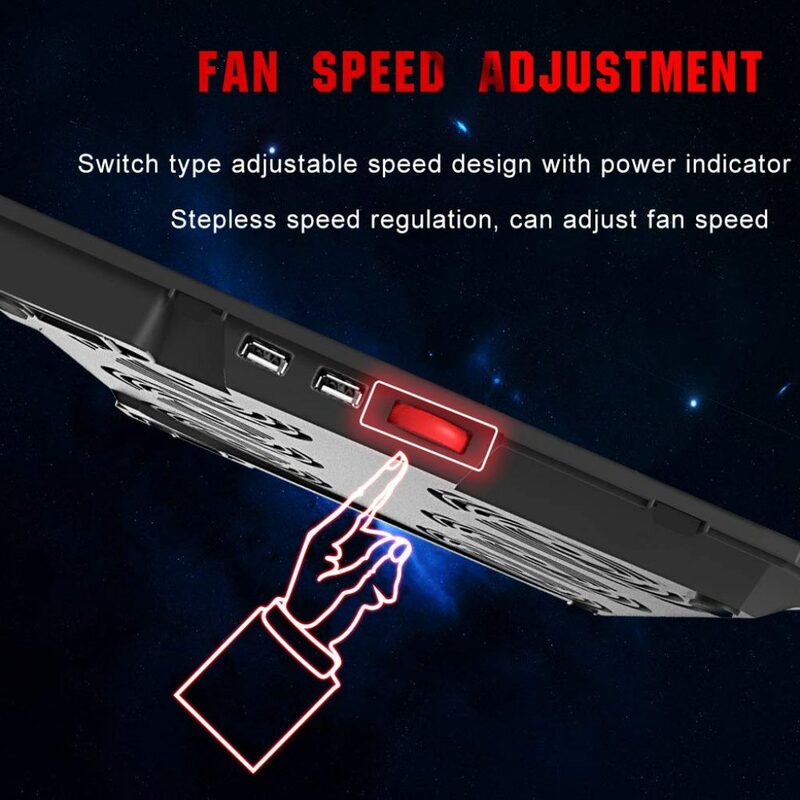 Not only is the height and angle adjustable, but also speed, temperature, and the ‘wind speed’ of the central super powerful fan. 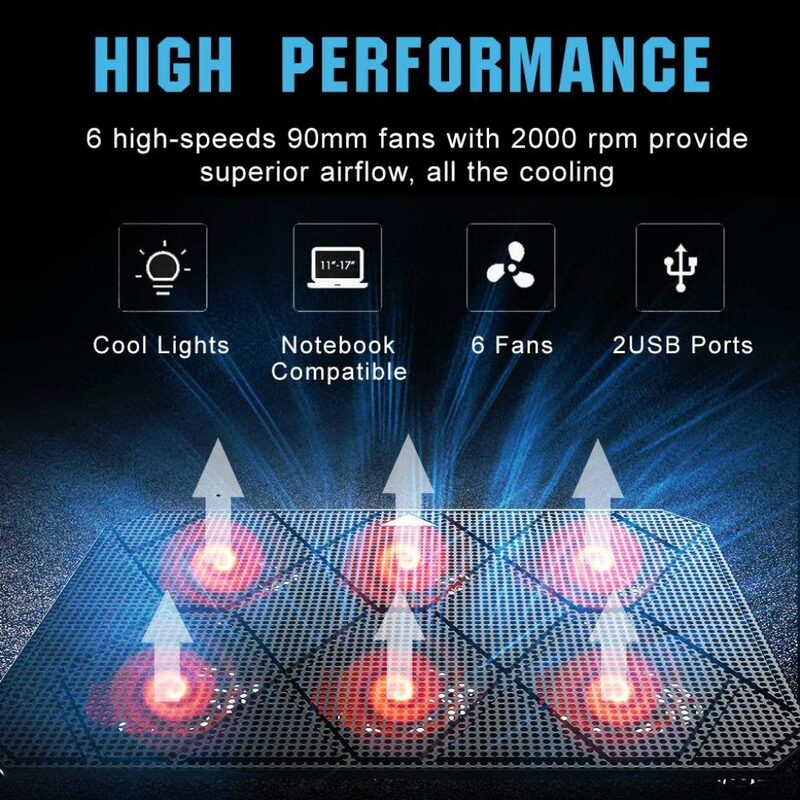 This all adds up to a highly efficient, good looking laptop cooling pad that worked well and very rapidly, thanks to the wind fan. 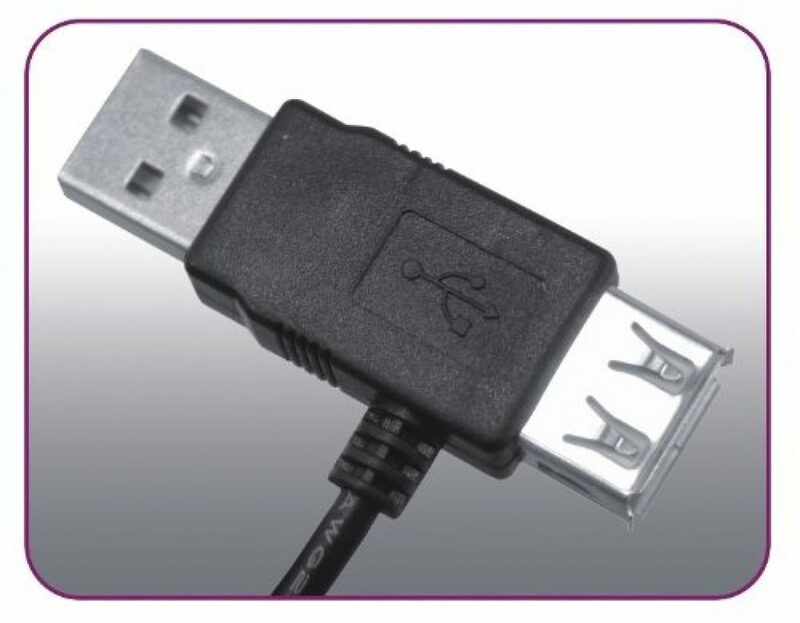 The included cables are quite long, but better that than too short, tying you to one spot. 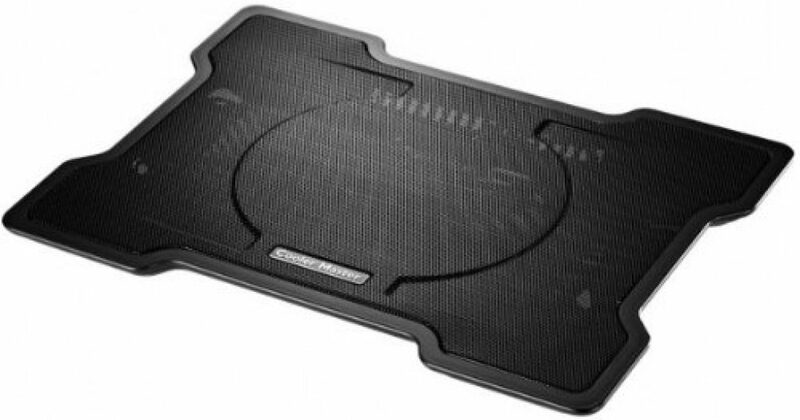 TopMate’s cooling pad is high tech, high spec and highly effective. This is one for the gift list! 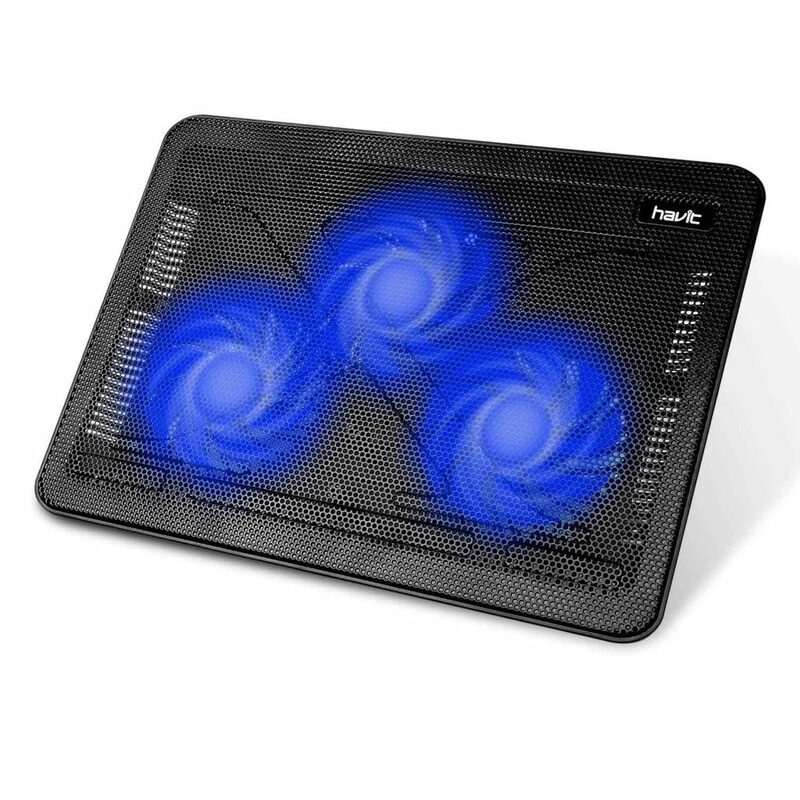 Cooler Master’s laptop cooling pad is smart, professional and available in several styles and colors. 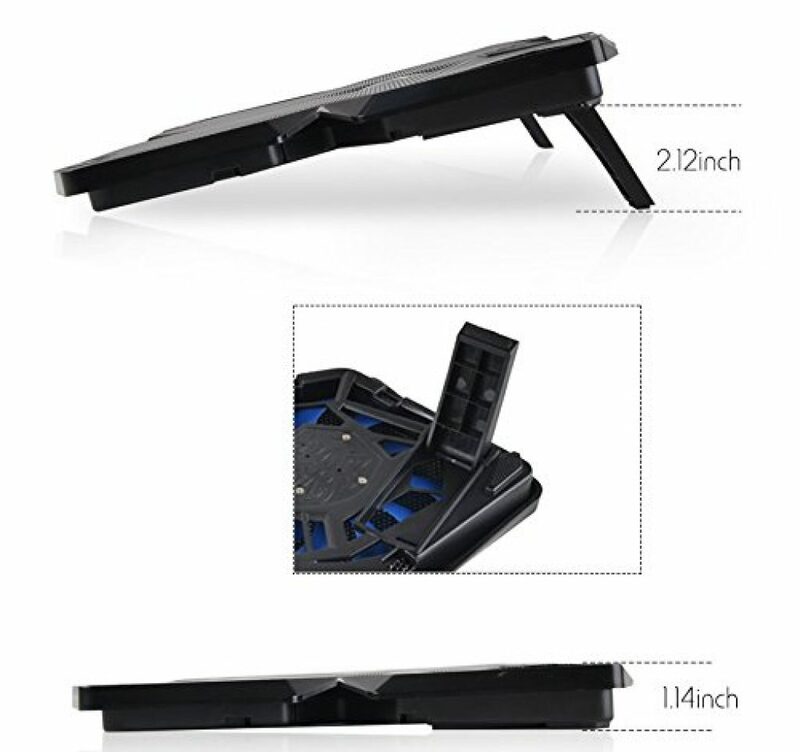 Easily portable, this, with its lack of LEDs, would be eminently suitable for a work environment. 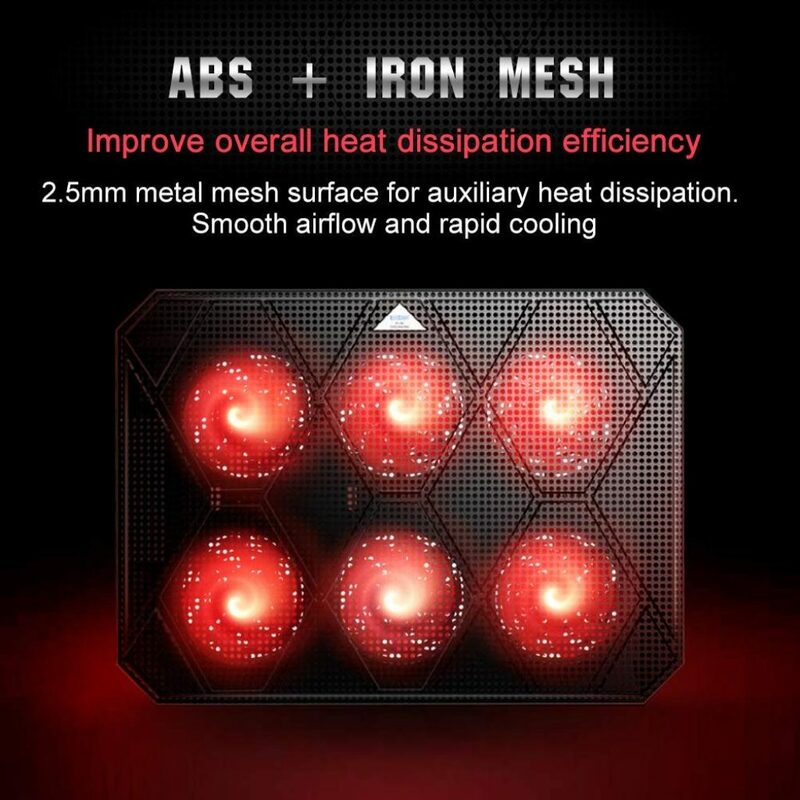 With just a single fan, our initial thoughts were soon dropped when we realised, thanks to the full mesh design, how efficient this cooler is. 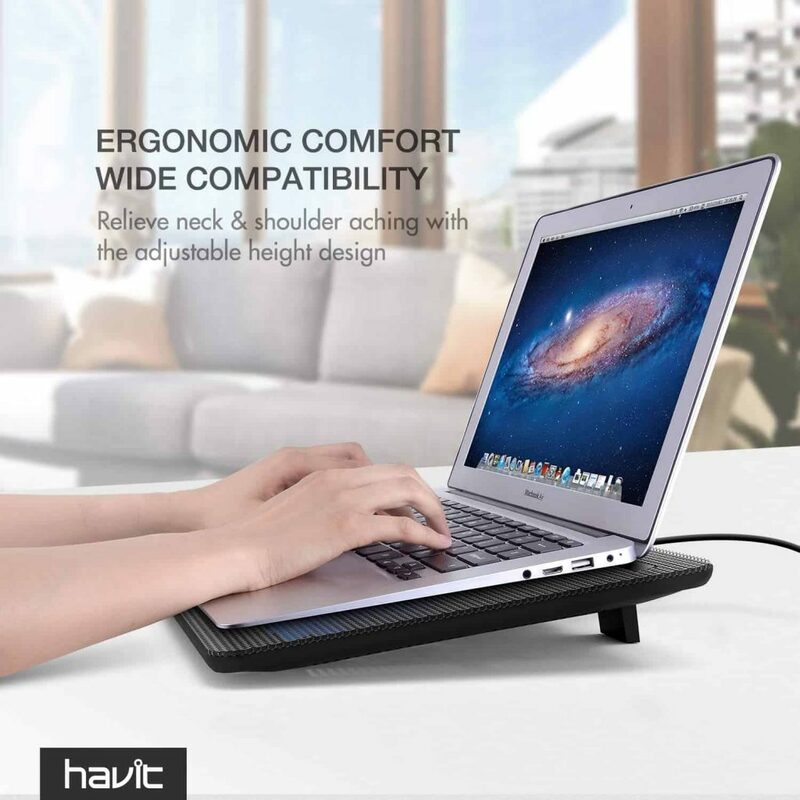 It’s height adjustable, has cable tidying grooves, and is completely silent, making it ideal for the workplace. We like this no-frills cooler – it does exactly what it’s meant to do, without any complaints. 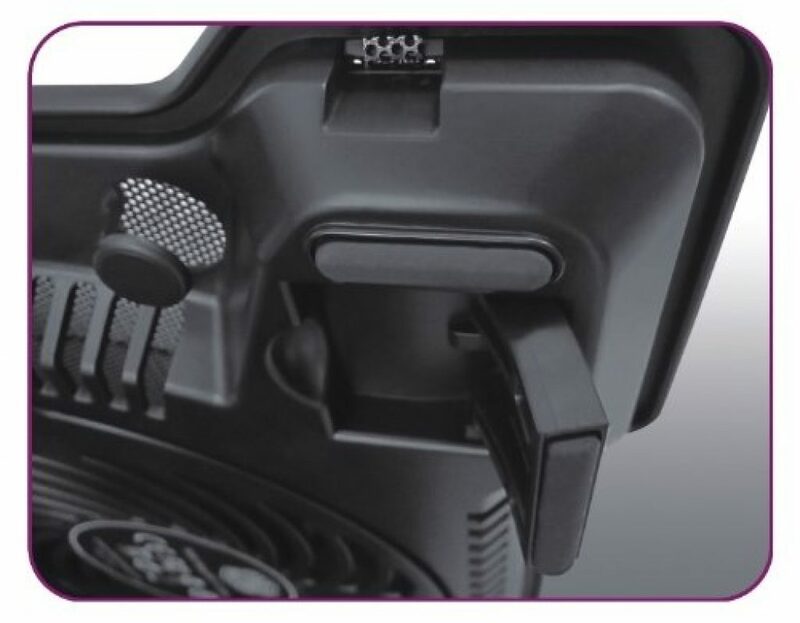 Although the cable grooves are a great idea, they could be channelled in a more effective way. 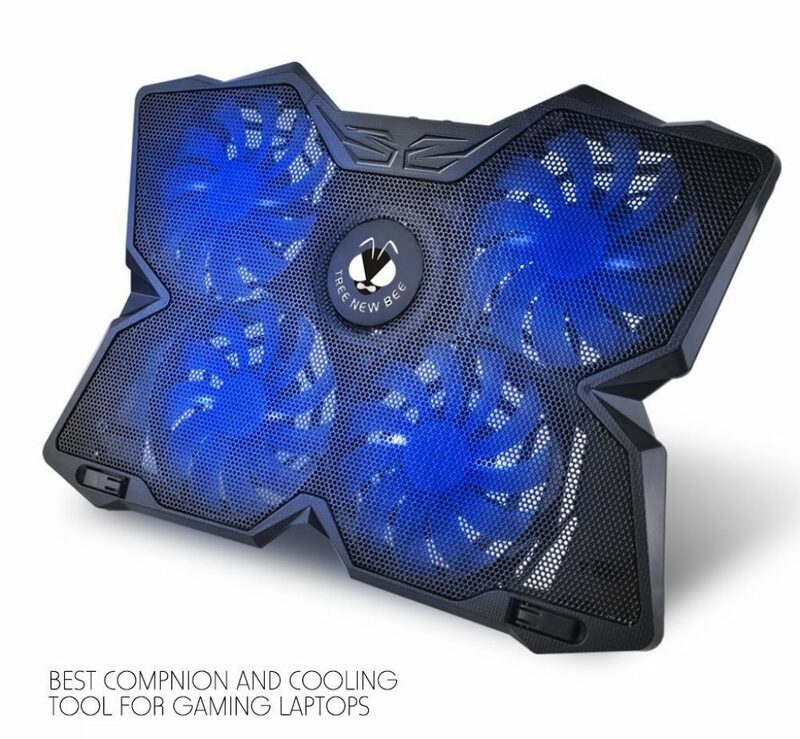 If your work laptop gets more overheated and stressed than you do, this cooler is a great purchase. 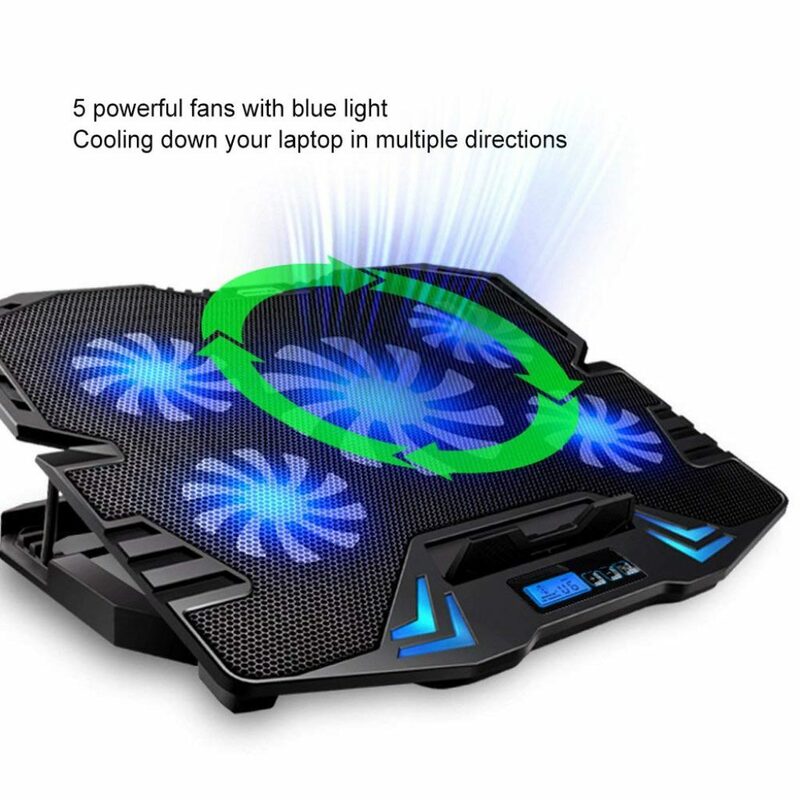 Looking like a UFO accessory, this blue glowing cooler’s unusual shape is certainly eye catching. 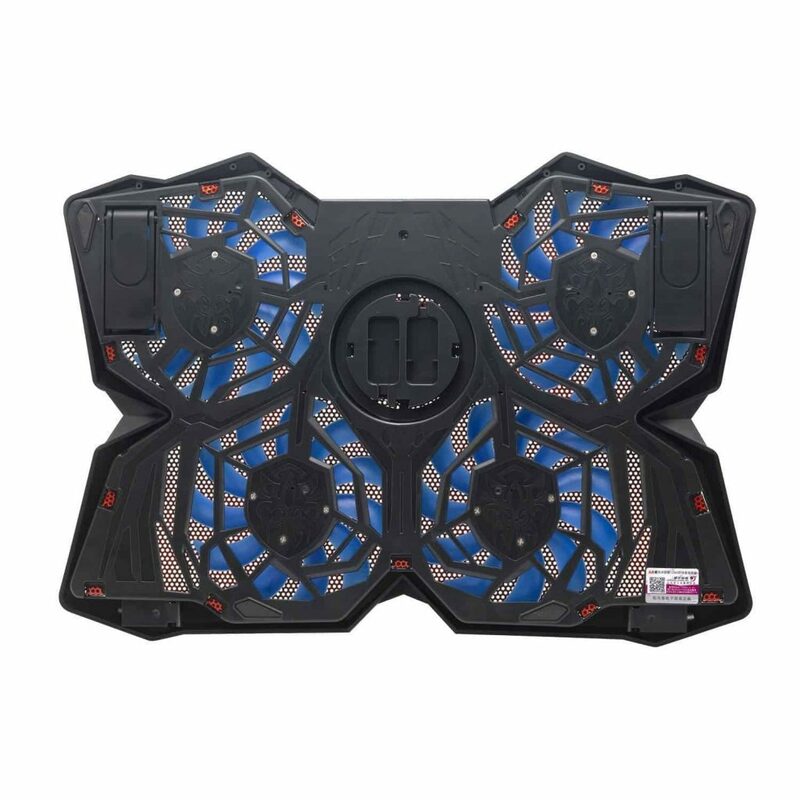 It’s easily positioned with adjustable height settings, and the four fans create a silent & interference-free space. 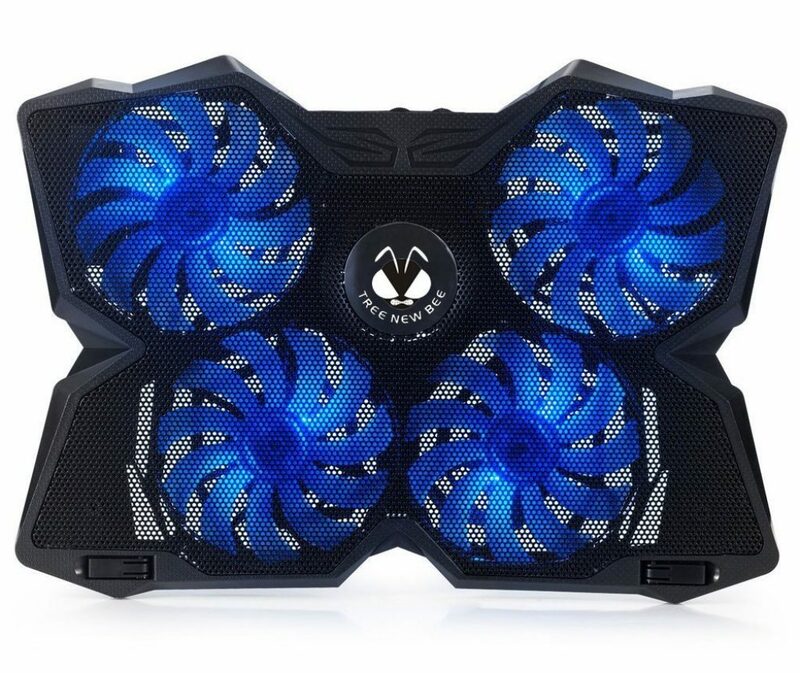 Hard wearing, light to carry, and with two USB ports, this cooler is looking good, so far. 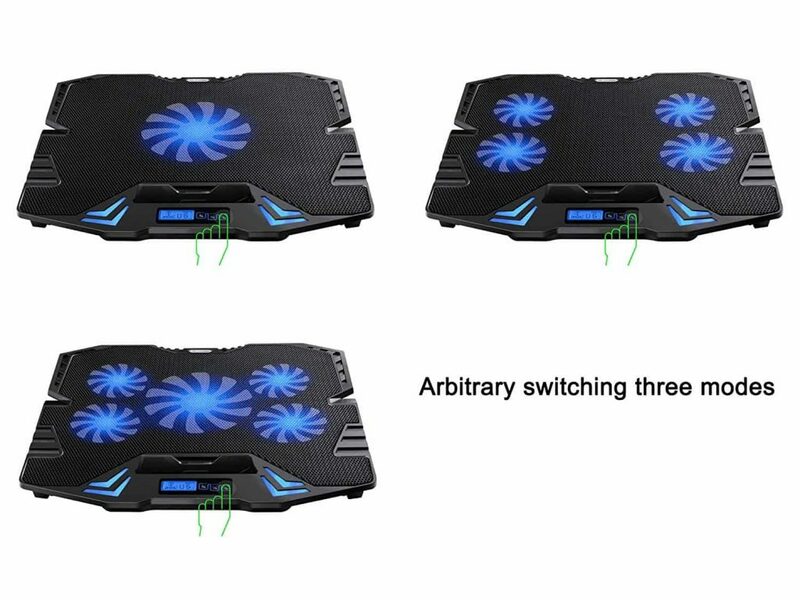 We originally thought that the unusual shape would make it difficult to fit our laptop, but no, it worked perfectly and proceeded to chill the overheated guts of our device. 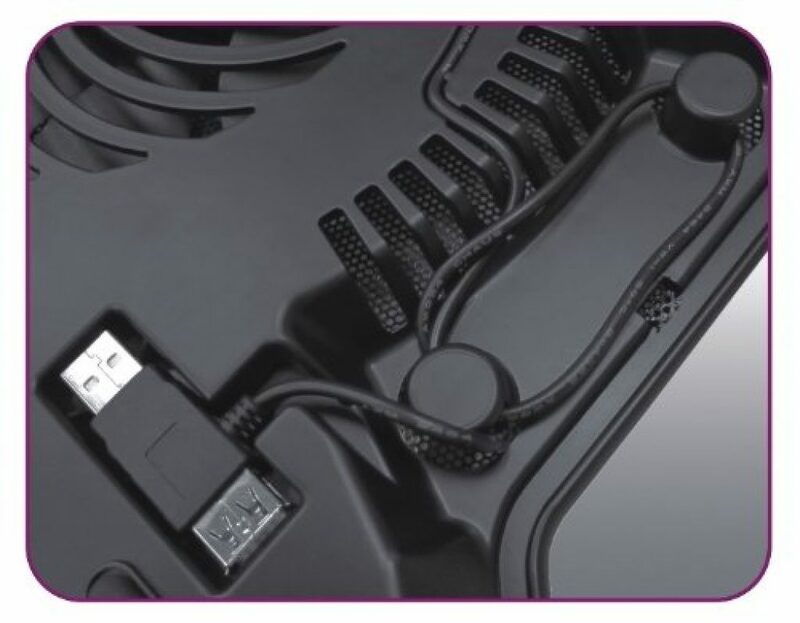 Dual ports, anti-slip design, and stylish braided cables mean that this efficient cooler, not only works well, but looks great too. 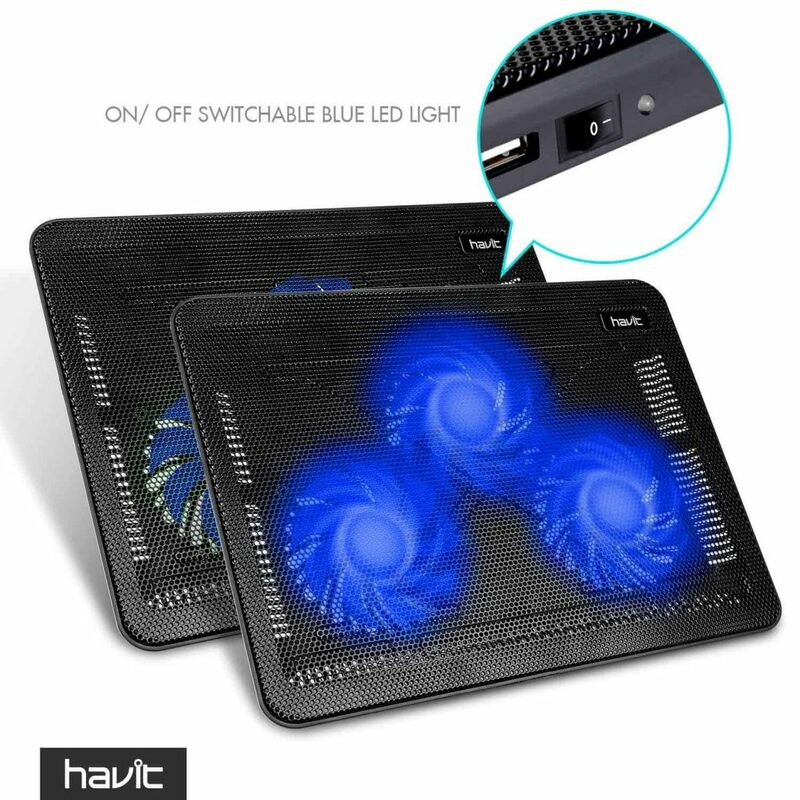 The glowing LED lights cannot be independently switched off – we love them, but others may find them distracting. 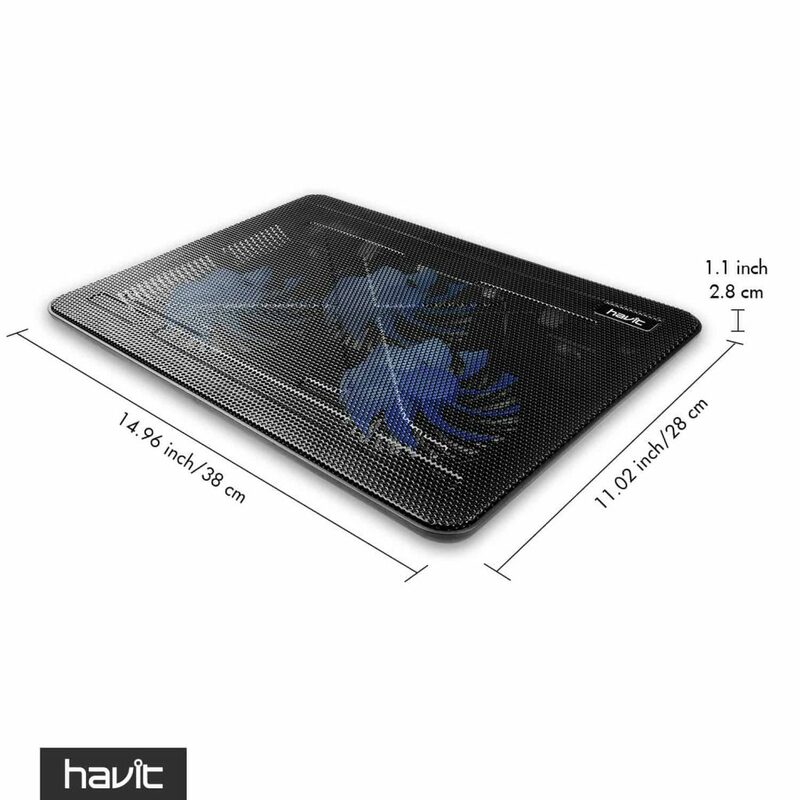 An eye catching stylish design and the ability to rapidly cool your laptop make this cooler well worth considering.